Above: Joseph Giunta leads the Des Moines Symphony into its 82nd season this year. The Des Moines Symphony today announced its 82nd season, including two dates this summer—July 14 and 28—for its first concerts at the new Water Works Park Amphitheater. Sept. 21 and 22, the Masterworks season opens with an all-Tchaikovsky program replete with scenes from Shakespearean and Russian literature. Oct. 12 and 13, celebrate the 10th anniversary of the John and Mary Pappajohn Sculpture Park with a suite from Symphony in Sculpture. Nov. 9 and 10, Dvorak’s Eighth Symphony, plus Grieg’s Piano Concerto with pianist Jon Kimura Parker. Feb. 8 and 9, violinist Grace Park is featured in a program spotlighting Mendelssohn and Brahms. March 14 and 15, 200 voices join the symphony in the choral masterwork “Carmina Burana,” plus orchestral works by Beethoven and Wagner. April 18 and 19, enjoy the symphony’s springtime jaunt to Paris, with soloist Camille Thomas. For more on these concerts, plus the three-concert pops series (including Broadway icon Bernadette Peters on April 4, 2020) and more, go to dmsymphony.org. 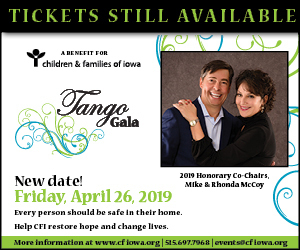 Subscriptions may now be purchased from that website, by calling 515.246.2300, or at the Civic Center ticket office, Single tickets will go on sale later.